Lean was the focus of the Midwest Coatings Seminar on August 8th in Salina, Kansas. Gary Conner from Technical Change Associates shared many valuable stories from his experience implementing lean for his own company, as well as leading companies on their lean journey. Brad Muir, president of Technical Change Associates continued the discussion reviewing a variety of plant layouts. The group of approximately fifty attendees from regional manufacturers learned that the implementation of lean is more than using the lean tools. Working with the diverse personalities of a team and listening to their concerns will help ensure a successful outcome and build a culture of continual improvement. Brad shared before and after’s of plant floor layouts. One case study from a few years ago presented an impossible challenge for the manufacturer due to constraints on the finishing line. At the time, Brad concluded that the layout he desired was impossible because of the limitations of the conveyors. Upon learning more about IntelliFinishing, Brad and the IntelliFinishing team designed a couple of different layouts that would have worked for the manufacturer. Dan Stutterheim, CEO of Kasa Companies followed up with a presentation on Eliminating Waste from Communication. 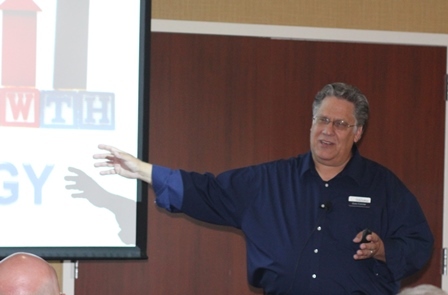 David Underhill, IntelliFinishing Sales provided a presentation on Improving Production Line Gaps.